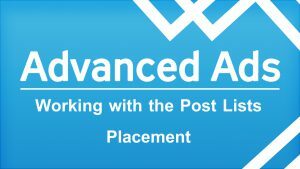 The Posts Lists placement that comes with Advanced Ads Pro allows you to inject an ad between posts on post list pages like home, categories, tags or any other page with a list of multiple posts. You find the Post Lists placement under Advanced Ads > Placements. When creating a new placement you only have to select the Post List placement type and enter a name in order to save it. After saving, just select the post index before which the ad should show up. E.g., if you want to display the ad between the second and the third post of the archive page then select “3” here. If your theme or any other plugin creates post lists aside from the default WordPress loop, you can enable the Secondary Loops option in the additional placement options. This would inject ads also there but could lead to showing ads in multiple other places as well, though. use the Custom Position placement.